Christian Fuscarino, the head of Garden State Equality, feels optimistic for the first time in a long time. In many ways my new husband Aaron and I exemplify the non-traditional, contemporary couple, although we met in an old-fashioned, romantic movie fashion. We were in a little dive bar. Our eyes locked immediately, and then for the next few hours, I don't think we looked away as we talked. There was a sense of comfort with each other, yet a beautiful flutter of butterflies inside our stomachs that made it all very exciting. That bar, in Asbury Park, N.J., has since shuttered, but we have become a public, engaged couple in this progressive city, as social and political activists. 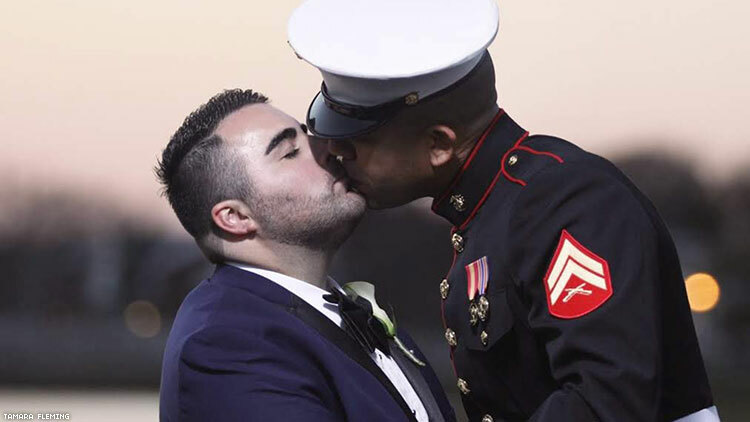 Aaron is openly gay and serving active duty as a United States Marine. I am the executive director of the largest LGBT education and advocacy organization in New Jersey. But we are not only two men getting married, we are also an interracial couple. In the age of Trump, some would consider our wedding a strong political statement, and I suppose it is, whether we intend it to be or not. However, as “untraditional” as this may seem, we rarely think about it. We are just two people deeply in love, and the moments we share, selfishly, are for ourselves. That said, our lives are also very public and we choose to live out and proud, not something everyone in our communities has the luxury of doing. And we both work to make our country – our world – a better place. Each in our own way and also together, as an example for LGBTQ youth, youth of color and anyone who longs for the kind of love and relationship we have been blessed with. It has not always been easy, it has been worth it. Our earlier years were spent in Brooklyn but we have also gone from communities rich with diversity to more rural, less diverse areas because Aaron has been stationed in North Carolina. Heads sometimes turn when we are together. For several reasons. Gay, interracial and the fact that Aaron is 6 feet 7 inches tall, and I, well, am not. Aaron speaks openly about me as his partner, just as other Marines talk about their families. No matter where we live. He knows that people are stunned sometimes, but it's important to be out for the sake of the LGBT community at large. In June of 2018, the United States Marine Corps hosted the first ever LGBT Pride Month Panel, where openly LGBT marines shared their experiences in the corps. Mr. Williams was the only male Marine to participate on the panel. At a recent Marine Corps Ball, when he introduced me as his partner, one wife of a high ranking officer could only respond, "Oh, well that's new!" Um….not really. What’s new is his ability to serve openly. Our ability to be open and honest about our relationship. We know too many people who for too long hid their full selves, and in our current political climate that is increasingly divisive it is all the more important to continue to live our lives publicly and with authenticity. Despite existing openly and proudly in two drastically different spaces, the truth is that there isn't much difference between people in blue states and people in red states. At the end of the day, everyone just wants to be treated with respect, whether they are liberal avocado toast lovers in Brooklyn or conservative gun lovers in the infantry of the Marine Corps. These seem like especially difficult, even frightening times, and they are, especially for anyone considered the “other.” But I continue to have hope and faith. I know the current political climate has disproportionately represented a divide between Americans. In my work at Garden State Equality, I have worked closely with both Democrats and Republicans on LGBT issues. While it is unlikely a Democrat congressperson from New Jersey would be against an LGBT issue, Republican members like Congressman Tom MacArthur have also played an important role for the LGBT community, like when he worked with GSE drafting a letter to the Air Force to ensure that pilots would have access to Truvada, a critical preventative drug against HIV and AIDS. Having allies on both sides of the aisle proved successful when Secretary Wilson signed letters in September letting the Air Force members know that Truvada was added to the list of Approved Aircrew Medications. A simple victory building bridges between both Democrats and Republicans, and subsequently both my and Aaron’s worlds. I am realistic, I know that despite the success we've had and the welcoming spaces we have been in, there is hate, but we feel strongly that the majority of people live a life driven by love. We look forward to pledging our love to each other within a traditional military wedding, just as we have done for their community and country. We plan to donate a portion of our gifts to the USO and Garden State Equality, two organizations working to improve the lives of our nation's service members and the LGBT community. That gesture exemplifies who we are, what we care about and hopefully, the fact that together, we can help bridge some of the gaps and divisiveness that is defining the debate in the country we both love very much. CHRISTIAN FUSCARINO is the executive director of Garden State Equality, New Jersey’s largest LGBT organization.